Thank you for visiting our site! 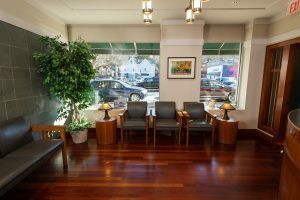 Our main goals are to deliver exceptional dental care that is tailored to your individual needs in a caring and comfortable atmosphere, to provide you with answers to all your questions so you can make well-informed decisions. Please contact us today with your comments or questions. Did you know we have a sister location in Scarsdale? Click below to visit their website. From NYC and Lower Westchester County: Take the Saw Mill River Parkway North to Exit 32 (Route 120, Chappaqua). Make a left at the stop sign at the end of the exit ramp. At the traffic light, make a left onto Route 120 and continue over the bridge. Where the road forks, bear left and proceed to the stop sign at the bottom of the hill. Make a slight left onto North Greeley Avenue and continue straight until the stop sign. Go straight through the stop sign for 0.1 miles; 30 North Greeley is in the brick building to the left (before Rite Aid) with public parking across the street. From White Plains and points east: Take 287 West to the Sprain Brook Parkway North (exit #3). Take the Sprain Brook Parkway North to the Saw Mill River Parkway North. Follow directions from NYC and Lower Westchester County above. From I-84, I-684, Mt. Kisco, Katonah, Somers: Take the Saw Mill River Parkway South to Exit 32 (Route 120, Chappaqua). Make a sharp right at the stop sign at the end of the exit ramp. Continue straight through the stop sign to the traffic light. Make a right turn at the traffic light. Where the road forks, bear left and proceed to the stop sign at the bottom of the hill. Make a slight left onto North Greeley Avenue and continue straight until the stop sign. Go straight through the stop sign for 0.1 miles; 30 North Greeley is in the brick building to the left (before Rite Aid) with public parking across the street.